The Detroit Symphony Orchestra hopes to raise $1 million. 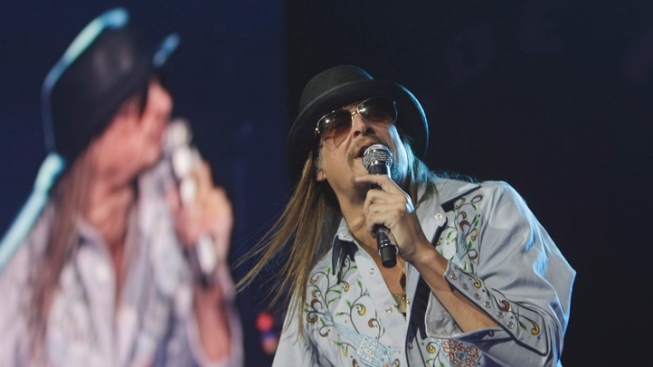 Kid Rock is known for dabbling in all kinds of musical genres: hip-hop, hard rock, country and Southern rock. Classical? Not so much. But he jumped at the chance to play a show with the Detroit Symphony Orchestra. This time last year, the Detroit Symphony Orchestra was about a month removed from a contentious musicians' strike that worsened its already strained finances. Now, the rebounding organization aims to raise the roof — and hopefully $1 million — with help from a hometown musician known more for rock, rap and country than classical. The orchestra will collaborate with Kid Rock on Saturday in a benefit concert at the Fox Theatre, down the street from the ensemble's Orchestra Hall home. Tickets start at $100, though VIP tickets fetch as much as $1,500 and include an afterparty with the genre-jumping artist who still lives in suburban Detroit. Rock, who was born Robert Ritchie and grew up in Macomb County, Mich., is volunteering his services. So are Detroit Symphony Music Director Leonard Slatkin and orchestra members. Proceeds will help pay symphony musicians for community outreach and education efforts. "As a musician, and of course a Detroiter, I am proud to be supporting this longstanding cultural institution," Rock has said of his show with the orchestra. One night — even one that rocks and rolls in big money — doesn't erase bigger, long-term woes for the internationally recognized orchestra. Musicians agreed to major concessions during the six-month strike that ended in April of last year, but that's only slowed the orchestra's $2.5 million-to-$3 million annual drain of a roughly $14 million endowment that it draws from to survive. And officials have been mired in a so-far unsuccessful effort to restructure a $54 million bank loan on a real estate deal for the Max M. Fisher Music Center. The lingering debt came before the labor strife but it's "certainly become more acute after the strike and we returned to concerts," said Paul Hogle, the orchestra's executive vice president. Hogle said as long as the money is owed, the orchestra cannot increase its endowment. Still, in the short-term, "we're performing, broadcasting, we're being an orchestra," he said. "We still have an enormous amount of work to do," Hogle said. "But the business of performing and attracting talent here is in fact returning and vibrant." He cited the hiring of seven musicians, including incoming concertmaster Yoonshin Song. The orchestra announced this week that the 30-year-old member of the Saint Paul Chamber Ensemble would permanently replace Emmanuelle Boisvert, who left after the strike to become associate concertmaster with the Dallas Symphony Orchestra. Several of the recent departures can be traced to the contentious walkout or settlement that left musicians with a roughly 25 percent cut to their salaries. Hogle said the hiring process is restoring the faith across the organization. "As a result of the auditions we've already had this year, it certainly suggests that Detroit and the music-making legacy here continues to be attractive for candidates," he said. "That bodes very well for our future." Hogle said he's also excited that more than 100,000 people have tuned in to the orchestra's webcasts this past season. Much closer to home, the orchestra has inaugurated concerts in a half-dozen Detroit-area neighborhoods — drawing a suburban audience largely composed of audience members who haven't attended a performance in Detroit. Drew McManus, a Chicago-based orchestra management consultant, said he's glad to see some good signs after so much strife, but he lacks enough information to conclude the Detroit orchestra is succeeding in its turnaround plan. "Is the organization going to be able to stabilize and look at a new growth pattern? All that hasn't transpired in the year since the (strike) ended," McManus said. He said the upcoming concert featuring Rock backed by the orchestra is "a good thing" and could be a successful one-time event. McManus would like to see it inspire a series of rock-flavored shows, using the Dayton Philharmonic Orchestra's successful Rockin' Orchestra Series as a model. "It's far more beneficial for an organization if they can develop that into a series," he said. "It's a really smart financial move: It shores up their bottom line and supports the core mission activity." Hogle sees the collaboration with Rock as recognition of how far the orchestra has come, and a fitting example of where it can go. "It's the perfect culmination of what we will look back on as a very successful year," he said "A year ago, our stage was silent. And today our hall is regularly full. We have an increase in donations. And, we're performing with Kid Rock."